If you want a cool print to decorate your wall why not have a look at the V&A prints site? For retro lovers out there, there is a whole section dedicated to the Swinging Sixties. There are lots of images from the world of fashion, music, design, politics and advertising. 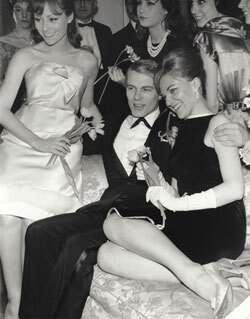 This one of Adam Faith with rank starlets, by Harry Hammond has caught my eye, must be something to do with watching all those episodes of Budgie recently. This image captures him pre-Budgie at the height of his film and music career, in 1959/60. Whichever image you choose, you can get a photograhic quality print in a range of sizes and finishes. A large 508mm x 762mm (30" x 20") print will cost you £50, and can be ordered online. Take at look for yourself on the V&A prints site, which it promises will be regularly updated with new images.